Shannon Leigh was hired by San Mateo County CCD after they had spent significant time working with a signage consultant that the general contractor had contracted. After the team saw the results at Skyline College, they abandoned the previous design and design firm and had us start from scratch to implement a new program that was similar to the Skyline project. 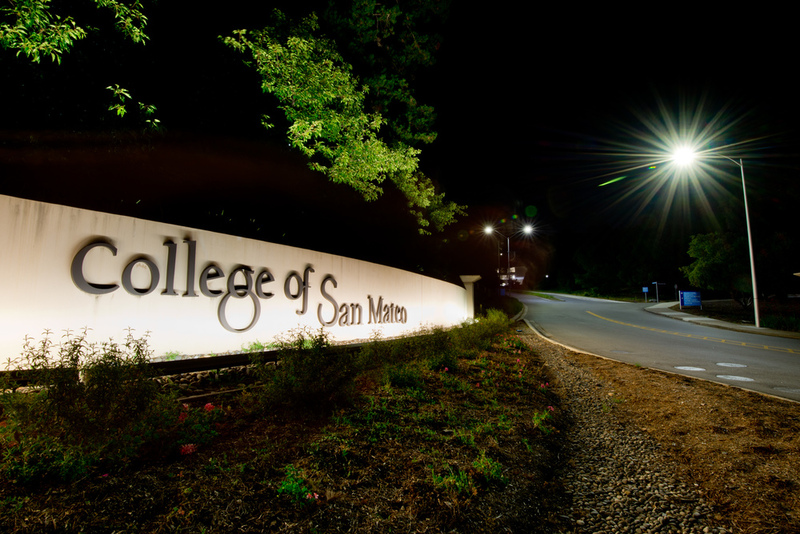 We were contracted directly by the District and joined the McCarthy Construction design/build team to design the new program for the College of San Mateo. The program included renaming the parking lots, parking lot pole signs and fee machine signage. Our team then designed a building name and numbering program for all buildings. Unique to this project, the architecture was a key element to creating place. A few special amenities and buildings needed special treatment. The library and theatre in particular were highly visible and received marquee status with custom signs that matched the program but gave special prominence to each venue, welcoming many outside visitors. Once this exterior campus work was completed, we updated the interior signage to comply with the new ADA and CBC codes. We also added special features to the Student Union to highlight the bookstore, cafeteria and learning resource centers. This work led Shannon Leigh to creating a district-wide sign standard for the San Mateo County Community College District’s (SMCCCD) Facilities Department. This is a crucial part of their ongoing operations to keep the program updated accurately and keep all departments on track.